It was one of those oppressively hot days in late July when I happened upon a green gate off rue des Rosiers, just a block from my apartment. I had never noticed this gate before, so I peaked in. To my surprise, I found a whole city park I never knew existed! 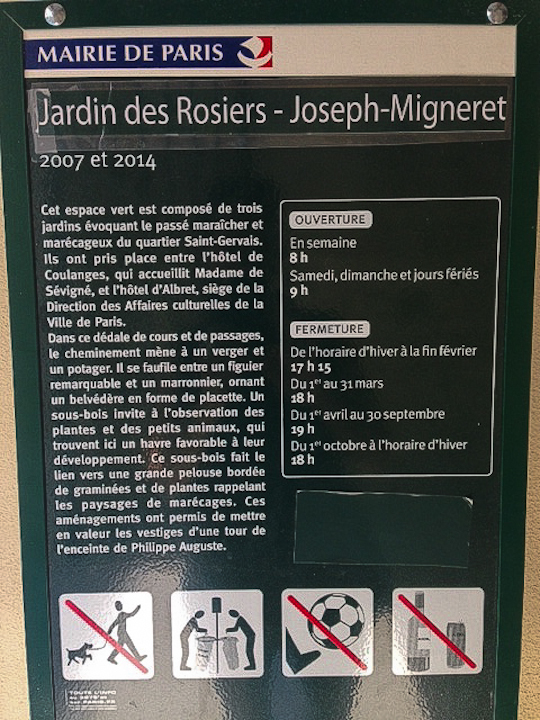 And a beautiful one at that–the Jardin des Rosiers – Joseph-Migneret is a welcome little oasis of green and calm in the heart of the Marais, in an otherwise bustling neighborhood. I followed the linked courtyards (and then signs for a public toilet) through the back entrance to the Maison de l’Europe, where I found a receptionist. 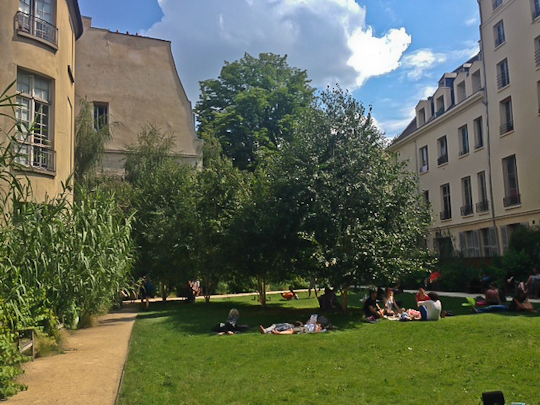 I asked how long the park had been open to the public and learned that the park had been there for quite some time, accessible via the Maison de l’Europe at 35-37 rue des Francs Bourgeois. 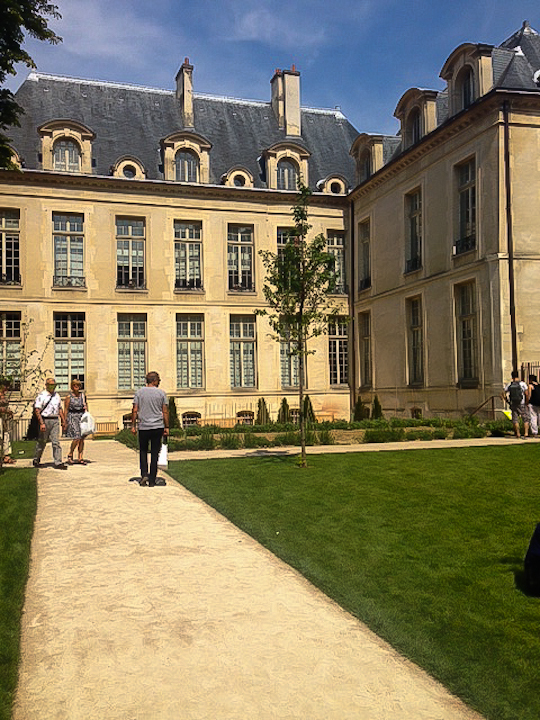 But the courtyard accessible at 10 rue des Rosiers had just opened that week. A brand new park and right in my backyard! After the loss of so many of his students–only 4 students returned to school on October 1, 1942–Joseph Migneret dedicated himself to the Resistance and to helping the Jewish families escape further round-ups and persecution. He hid many of them in his own home. You can read more details of Migneret’s story here. Joseph Migneret died shortly after the end of the war; it is said he died of sadness on account of everything his students endured. The day I first sat down to write this post, I saw that my friend and neighbor, Richard Nahem, of I Prefer Paris had just published his own write-up of this exciting find. So instead of repeating his work, I also encourage you to read his post here! Unfortunately, this new park is not open in the evenings. But it is open 7 days a week and–brace yourself for this one–they even let you sit on the grass! Next time you are in the neighborhood, be sure to take a few minutes to explore this new addition, or bring a picnic and stay a bit longer!